I love what Heather from The Other White House did with some paint, a canvas, and her kids! What a fun Christmas decoration that would hold great memories! So funny–we just used this same exact idea on dish towels, as one of the gifts for the grandparents! Looks great! I am going to have to try this–thanks! HOW did I miss this last year? It’s so adorable and I just now saw it on Pinterest. Love. 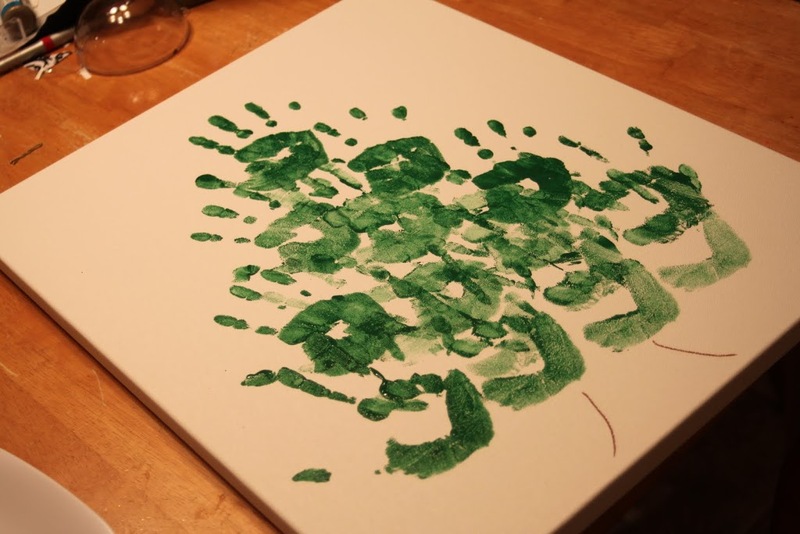 Planning on doing a variation of this for my daughter’s first bday to remember her paint party. Each guest will put their handprint and hopefully a fingerprint ornament. I think it will be loads of fun to pull out at Christmas time each year. Thanks for the inspiration and ideas. Just saw this on pinterest and I want to try with my boys. Curious on what kind of paint to use though. I’m not super crafty and my boys are only 2yrs and 6 months. I think washable Tempera would work well. I think I will try this with My daughters and grandchildren it will be a wonderful decoration every year for Christmas. I have done this with my Child Care kids only I have the hands pointing down. It makes it look more like the branches of the tree. We did this last year with my mom’s 10 grandchildren. Each child did 2 handprints (same hand twice) and I painted a red ball between each set of prints and wrote each child’s name next to his prints The oldest children did the bottom of the tree and the youngest was at the top. We used poster paper for so many hands. 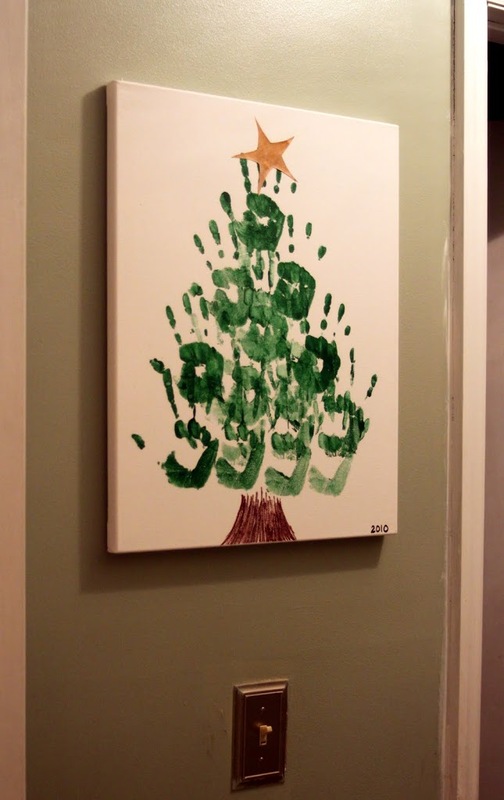 super cute, i wonder how it would turn out of you painted differnt color finger tips on the kids hands so they would be putting the ornaments on too? Start this when your child is 1. Do one handprint. Then, when they’re 2, move down to the next line and do two handprints, then 3 handprints the next year when they’re 3 and so on. Do this until you’ve reached an age you would like to stop. Each year the hand will get bigger as it moves down. This will take a few years to complete, but imagine what an amzing keepsake it would be! I wish I would’ve done this with my children. love your idea KellyK. Could even do a handprint every 6 months. Thanks for the awesome idea! Just made 3 of these yesterday with my 2 1/2 year-old; he had so much fun making these as gifts for both sets of grandparents (and one for us he insisted!). Used acrylic on canvas. Just curious.. what did you put behind the canvas so there was something solid behind it while the kids were dong the handprints? The canvas I have is already stretched over a frame so if I set it on the table, there is nothing behind the canvas. I was thinking of stacking some books behind it? Any better ideas? You could stack books behind it for a solid surface. The Other White House blog is now private. So there is no direct link to the tutorial, but I will live the photo/post up for inspiration. Would love to know what paint you used and the size of the canvas and what you used for the stump and star? I can’t see the tutorial either! We did this yesterday. I have 6 kids so I wanted them each to have a “row” so I used a 18×24 canvas and had JUST enough room for the star on top. I used acrylic craft paint from Walmart. My children each have a “color” for towels, cups, etc so everyone knows which is theirs- so they used their fingerprint in their color to make lights in the white spots left by the palm prints. Turned out ADORABLE and very easy!